Read our beginner’s guide to Macao and you’ll be ready to visit a destination that seems to be popping up in conversation a little bit more than it used to. In 2013 it featured predominantly in the Bond Film Skyfall and (the city was also a plot-device in The Man with the Golden Gun) and in 2016’s Now You See Me 2 giving audiences a taste for this lesser known destination only 40 miles from Hong Kong. This cinematic mention could explain the recent rise in travel to Macao. It’s becoming an increasingly popular destination for people doing a multi-destination holiday to Asia and makes for a great city-break before enjoying the beaches of Bali or Thailand. 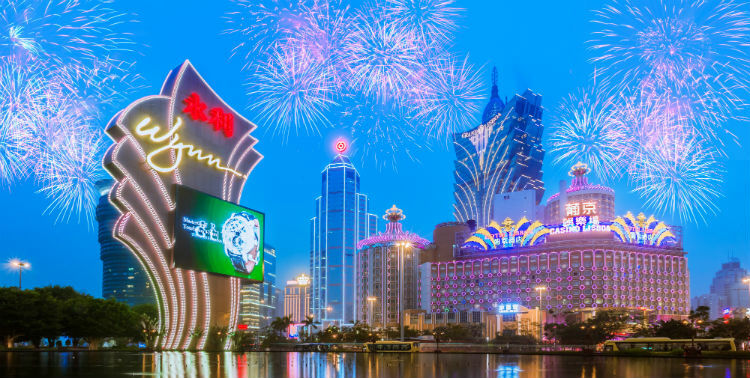 If you’re considering somewhere different for your Far East holiday we’d highly recommend Macao – here’s everything you need to know before booking that trip. After exploring the beautiful UNESCO-listed Historic Centre of Macao (the perfect reflection of Macao’s unique Portuguese-Chinese heritage) and the traditional Taipa Village we recommend heading into the Coloane district. Here you’ll be transported back to Macao’s past with pastel Portuguese-style houses and narrow lanes that are reminiscent of a Mediterranean village. You’ll also find two of Macao’s best beaches: Cheoc Van and Hac Sa. Few Asian destinations can beat Macao on entertainment and nightlife. Swanky rooftop bars, live entertainment, including the spectacular House of Dancing Water show, and glamorous casinos are set to a glitzy and illuminated skyline. Connected to central Macao by three illuminated bridges, much of the nightlife is located on the Cotai Strip, between Taipa and Coloane. Dominating the skyline the Macau Tower stands at 1,109 feet high, but don’t let its impressive height put you off. Once you’re at the top you’ll be able to enjoy incredible views of the destination – and mainland China – from its Observation Lounge. If you’re feeling adventurous, take your pick from a Skywalk, Tower Climb or the world’s highest bungy! Macao is home to a plethora of modern shopping malls and traditional street markets. First point of call should be the 200,000 square feet One Central Macao, the Shoppes at Four Seasons (Macao’s first luxury mall), or the grandeur found in the Shoppes at Venetian. Macao has a rich and vibrant foodie scene. Its multi-cultural past as a Portuguese port-city has resulted in a fusion of international flavours, As well as Portuguese and Chinese, Macanese is the local cuisine with spices and influences from Africa, India, Malaysia and South America. Signature dishes that we recommend while in the city are Galinha à Africana’ (African chicken) and Macanese Chilli Prawns. Beyond the glamorous nightlife and Portuguese-style houses lies Chinese temples, including the A-Ma Temple (the oldest in Macao). These temples have been pivotal places of worship for hundreds of years and primarily serve the Buddhist, Taoist and folk faiths. English is widely understood in Macao and most hotel staff will know how to speak it. On the streets you will hear a lot of Cantonese, while a lot of public signage is still written in Portuguese, one of the city’s official languages. Macao’s subtropical location offers a pleasant climate year round. Spring and autumn are warm and pleasant, while January to March is cool and dry and the summer months can reach temperatures of 30°C. Annual events that draw in the crowds include Chinese New Year, which falls sometime between the middle of January and February, and the Macau Grand Prix in November. If you want to fly direct from the UK, you’ll need to opt for Hong Kong International Airport and transfer via fast ferry (taking around one hour) from the Airport or downtown Hong Kong. The destination is also home to the Macau International Airport that offers numerous direct flights to other popular Asian destinations, making it really easy to fit Macao into a wider Far East itinerary. The official currency of Macao is the pataca (MOP), which is tied to the Hong Kong Dollar (the HKD is also widely accepted). Restaurants usually automatically add a service tip but its good practice to tip taxi drivers and luggage porters.